Need trenchless solutions for NJ sewer services? Pipe ramming is a useful trenchless solution for water line installation, sewer line installation, and pipe line installation in certain conditions. This approach uses pneumatic machinery to hammer the pipe into place, filling it with soil that is later removed. Suitable for pipes made out of steel, pipe ramming is one of many trenchless technologies that can eliminate the need for costly and disruptive sewer excavation. At A1 Sewer & Drain Services, we’re the leading local sewer contractor company for NJ sewer repair services like trenchless sewer line repair. 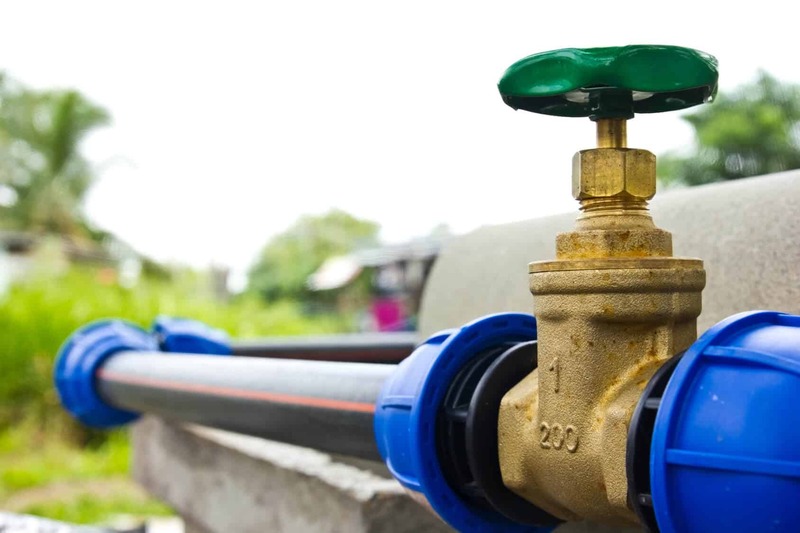 Our unique specialization, training, and experience with sewer repair in NJ makes us the region’s top choice for all your drain, water line, and sewer service needs. 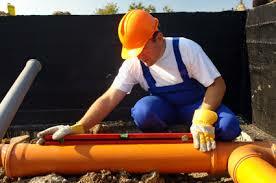 If you need sewer pipe installation or main water line installation without the hassle of sewer excavation call us today. 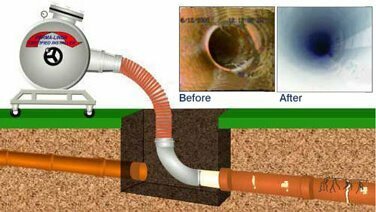 Free cost estimate and consultation on sewer repair in NJ. During pipe ramming, pneumatic hammer machinery uses percussive force to drive a pipe through soil. Excavation is limited to two pits on either end of the pipe’s intended path. If the pipe is entering the ground at the side of a slope, the insertion pit may not be needed. Ground conditions and available space determine whether the ramming action is carried out continuously over over the entire pipe length, or as a series of shorter percussive rams. Because one end of the pipe is open, soil enters the pipe during the ramming process. After the pipe has been inserted, the soil is cleared out from the inside. However, in certain ground conditions or for small diameter pipes, a closed end is sometimes used. Pipe ramming is commonly used for trenchless culvert pipe installation, or to install sacrificial steel pipe casings that house electrical cables or secondary pipes. Pipe ramming is ideally suited for pipes in the 150-300 foot range. Very stiff or hard soils, or soil containing numerous rocks larger than the pipe opening, may not be conducive to pipe ramming. 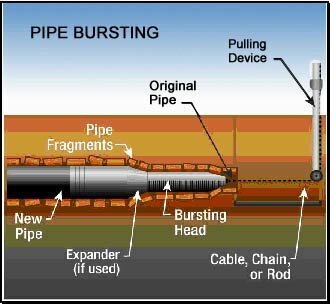 Pipe ramming is often a useful trenchless solution when augur boring or horizontal directional drilling are inefficient or ineffective. This can include particularly fine sand or soil with rocky cobbles, which could cause an augur or drilling head to get stuck. At anywhere from 400-10,000 lbs, pipe ramming machinery is also comparatively lightweight. Because the equipment necessary for pipe ramming is generally lighter than the machinery needed for other trenchless sewer installation options, it’s useful when only a tight space is available for setup and equipment. Pipe ramming for trenchless sewer pipe installation or water pipe installation uses strong percussive force from the pneumatic hammer, which creates vibration. This vibration is transferred from the pipe itself to the particles of the surrounding soil. While little research has been conducted on ground vibrations caused by pipe ramming, it may be useful to consider research conducted on another common trenchless solution for sewer line installation and repair: pipe bursting. Because pneumatic pipe ramming equipment and hydraulic pipe bursting equipment use a similar number of blows per minute, and soil displacement in both cases generally prevents soil compaction in the surrounding soil, they can be compared. In pipe bursting, ground vibrations diminish quite quickly with distance from the source. The vibrations have been found to be quite unlikely to cause any damage to underground objects or to surface structures. With pipe ramming for water or sewer line installation, surface disruption is also quite rare. The steel pipe remains in the ground throughout the process, and the soil remains inside of it during installation. There is little to no creation of underground voids that could destabilize surface structures. Because the volume of displaced soil is small, surface heave is also rare. As for the pipe itself, research into expansion and acceleration of pipes during pipe ramming have indicated that it actually creates more favorable load conditions than its common alternative, pipe jacking.